Vintage motorcycle enthusiasts have seen it all. Apart from a few upstarts in their forties, most of us are getting on a bit now: we’re in our fifties, sixties and seventies. After decades of riding British bikes, followed by decades of nostalgic restorations of them, seeing them at shows, etc, an ordinary machine in normal trim has started to get a bit boring. What to do? The answer, of course, is something our wives discovered years ago …accessorize. Ebay and the internet has totally rejuvenated our hobby. It was dying on its feet, along with its older members. Now it’s accessible worldwide and packed with information. Ebay is the world’s primary motoring museum. As most motoring ephemera and vintage motorocycle accessories are small objects, easily posted, such items have appreciated greatly in price. We used to have to wait for the annual Beaulieu Autojumble to buy such trinkets just one weekend a year. Ebay is 24/7. This Automobile Association BSA M21 Motorcycle Combination Patrolman’s Box is a rather large accessory. But if you fancy creating one of those famous outfits as a display item, this is obviously the hardest part to find. Once you’ve got this, all you need is a BSA M21 and a sidecar chassis and you’re sorted. M21’s are easy enough to find, and sidecar chassis are very cheap. This box was bought by Roy, the previous owner, 40 years ago. He originally had it on his BSA outfit, and used it on many Dragon Runs. He says that in those days he never thought about the AA box’s ‘collectibility’ but instead used it for its practicality when touring. And the reason he used a sidecar? – A lot of the rallies he attended were in Wales, in winter: when riding on ice he found the easiest way to slow down the motorcycle was to rub the sidecar wheel against the kerb. Roy stopped using an outfit around 20 years ago. The latest machine he had used it on was a Royal Enfield Constellation. So I think the fixing brackets on the rusty sidecar frame (sold with the box) should fit either a Connie or a BSA. I was sorely tempted to put this AA box onto a custom sidecar chassis with an obscure vehicle to pull it and turn it into an AA Recovery machine: Anyone who belongs to AA – Alcoholics Anonymous – could phone me up and I’d come out to them with the AA sidecar box stocked as a drinks cabinet to provide instant refreshment. I also suggested to my missus that we could use it as a drinks cabinet in the corner of the living room. Needless to say, this did not meet with approval (admittedly it would mess up the living room colour scheme) and she suggested I could save it for my eventual funeral. So that’s another idea – a novel idea for a coffin? Anyway, it’s over to you folks now…. 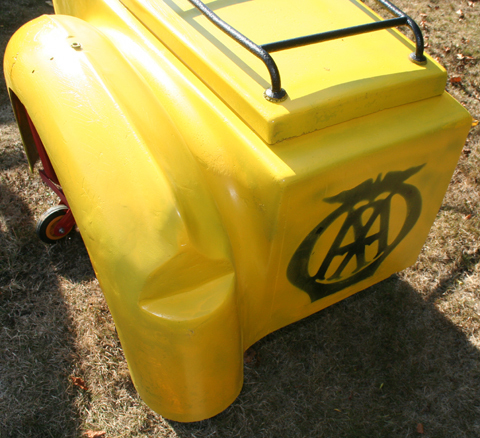 The AA was formed in 1905 by a group of motoring enthusiasts to help motorists avoid police speed traps. In 1906, the AA started putting up road danger signs, a responsibility charged to the AA until the thirties when local authorities took over. Three years later a free AA legal system was introduced to help motorists in magistrates courts; the AA handbook fist appeared in 1908. From 100 members in 1905 the Automobile Association grew to 83,000 by 1914. BSA motorcycle combinations were the mainstay of the AA’s breakdown fleet in the 1950s and the early 1960s. The AA used over 2000 of the M20, and later M21 models, and was the last purchaser of the M21 when production ended in 1961. The AA ordered a different specification from standard, which included a stronger front brake, a 12v alternator instead of a dynamo to power the two-way radio, and higher, ‘western-style’ handlebars. Various types of sidecar, leg-guards and fairing were produced. During the 1960s the need to carry more equipment (not to mention the desire of AA patrols to keep out of the weather) meant that the motorcycle combination was gradually replaced by the Mini van. It was the end of an era – the traditional AA patrol salute was abandoned in 1961, and the last BSA was retired in 1968. There are 4 BSA M21s on the AA’s heritage fleet, looked after by various AA breakdown patrols around the country. There is also a BSA M20 on display at the Meadowhall shopping centre near Leeds [Information from the AA website]. Unfortunately, when the AA upgraded to the Minivan and therefore decommissioned the sidecar outfits, they officially destroyed the patrolmens’ uniforms and ground the AA badges off the few sidecar boxes that were sold outside the service. As a result, very few remain nowadays apart from those mentioned in the AA report, above. The sidecar box in this sale has been stencilled with the AA insignia to replace the original badges. This fibregalss box is in sound condition, though could do with repairs here and there. The wood floor could do with replacing. Nothing difficult or time-consuming to do, just the sort of general repairs you’d expect for AA service plus 20 years of use followed by 20 years of dry storage. The sidecar chassis is rusty, but does offer useful fittings. DELIVERY: is not included in this auction. Our website contains details of recommended delivery services. United Kingdom – delivery is only £50 for this AA sidecar box and rusty sidecar chassis to most parts of England. North America, Australia, New Zealand, Japan – I can organize shipping for you. THIS SIDECAR IS SOLD FOR RESTORATION.